Every year, in the sleepy town of Kamuela on Hawaiʻi Island, hundreds gather from all over the island to celebrate sakura season at the Waimea Cherry Blossom Heritage Festival. Kamuela Liquor Store and World Sake Imports have a tradition of holding a sake tasting and teach-in during the festival for the store’s customers. It has become very popular over the last 13 or so years. 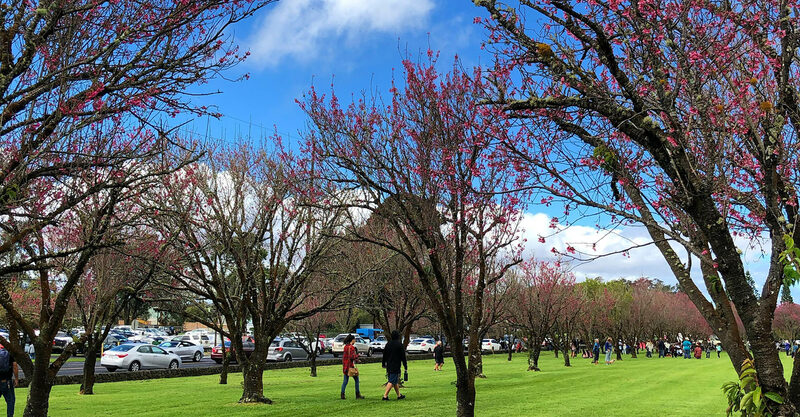 Visitors stroll through Church Row Park admiring the new blossoms, try local treats and enjoy taiko drums and the festival’s annual Bon dance. Many of them stop by to taste a selection of World Sake Imports’ premium labels and learn from sake expert Yoshiharu Suzuki.